help them “thrive” is unsurpassed. "Steve has been a tremendous resource for us and our organization. He believes in his programs, and his audience benefits from his expertise and passion. Steve has worked diligently with us to tailor our programs to make sure they meet the needs of our employees and we’ve received excellent feedback. More importantly, the participants who have attended Steve’s programs walk away with skills and knowledge they can apply to be more effective in their workplace and personal lives. Steve has absolutely helped us make a significant impact and I value the partnership we have with him." "By having Steve spend a few days in the field with our sales teams, he was able to gain critical insight into our people, our customers, and how they interact. Steve has been able to customize and tailor his programs because of the field work. We wouldn’t have it any other way. “Off the shelf”, vanilla programs are only beneficial if there is a one-off, short term need. However, to create lasting engagements and true development, customization is a must. The more sessions we do, the more Steve speaks our language and brings immediate credibility. We have seen remarkable results from our sessions with Steve. On several occasions, our sales people have been able to break through challenging customer relationships and get incremental orders while minimizing the competition and strengthening future interactions." "Steve and I worked closely together on a project to maximize customer interaction at the point of sale. Based on a process he developed, he trained our team to maximize their interactions with customers at retail. Because of this process, we were able to drive retention of our products and in effectively up sell the customer and not only drive our sales but that of the retailer as well. The success of the program was primarily due to the customization he did for our team. He worked with our team at retail to understand our business needs so he could build a relevant and real-world program that drove long-term meaningful success." "I found your workshops to be stimulating, well-prepared, very focused (which most lack, in my opinion) and designed to provide tools for the participant’s toolbox. No doubt, other participants felt the same from their interaction and participation and your excellent facilitation encouraged that participation and response." "Steve worked with several of our teams to empower them to communicate, and interact with each other to maximize project outcomes. With so many diverse groups within those departments that not only have different responsibilities and styles, effective communication is imperative to our success. Steve taught us simple, yet powerful skills which greatly improved our productivity – both individually and as inter-dependant teams." 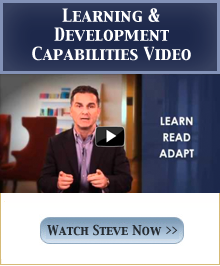 "Working through DISC™ with Steve has been a truly enlightening experience. I used to believe that certain people weren’t accessible to me because we were just different and didn’t speak the same "language." With DISC™ I was able to learn exactly what those differences were and acquire the tools to help me create a common language. As a result, I’ve become a more effective communicator." "Steve’s insights were very valuable in helping me change careers. He helped me see things in myself and my experiences that helped both speed and smooth the transition. I’m much happier now, and I owe a good deal of that to Steve." "Steve, you are great and from the bottom of my heart I thank you for challenging me to look at things in different ways." "While I had a good understanding of the coaching field, Steve’s Market Yourself To Success(SM) program gave me additional insight on how I can communicate effectively with people I never thought I could. Additionally, I now see this invaluable service as a must have for anyone who wishes to maximize their success as well as their happiness! " "Steve was very knowledgeable on the subject of Marketing Yourself To Success and managed to provide a wonderfully interactive workshop with handouts, overhead projected slides and Q&A throughout the seminar. Every participant left the workshop with a start on our personal marketing strategy. The session was excellent." "Just wanted to thank you for the great workshop. The information I gained gives me confidence and is helping me to move forward in creating a more profitable practice."